Discussion in 'Civ 5 - Community Call to Power project' started by gyogen2, Aug 26, 2014. Please expect some missing text, graphics, and probably a few bugs. There are some unit icons not properly working, but since I have to go to work, then have holiday plans, thought we'd go ahead and release so people could test play, then update later. The event system is included, but will probably need adjusting once users play test and we see how things work. Due to the content of this version Whowards DLL (either version) will be required to play in order for all aspects to work properly. Lots of content added with new release, But I have to go, so can't post it all right now. Far more new units, mechanics, and much more. If you discover any bugs or other issues, please let us know. Yeah feedback and bug reporting is very welcome. A mod from this scale deserves a playgroup. Anyway let us know if you encounter any strange behavior/bug or what else. If you also have any suggestions feel free to post. Now with more then 600 Technologies, 800 Wonders/Buildings, 300 Policies, countless Units/Resources and Beliefs. Many unique and endless communty features included. A total conversation that is probably the biggest mod for CiV outthere. Did this also happend to you to f.e with buildings wonders? I checked this, the language is in English, and the fall back system in CiV should work for this. Please tell me if you encounter other places with Text strings. 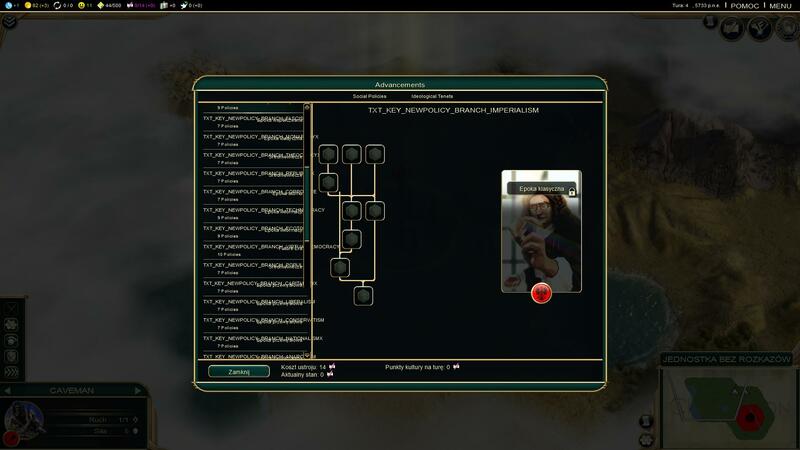 Or perhaps you should clean your moddata and cache, this works still wonders for CiV. - bug (?) with free technology at start. the technology "Time" is one of the few that miss a entry at all all. Yeah blame me, thats ok , but i moved this version ahead to blame me on game related parts. From a player source i would say damn you, but i need to keep the overlook and i dont want to loose the interest at all, so i figured out a way of doing my work in parts. I hope this helps, all new textentries can be found under CCTP/Text/NewTextsummary. Missing text parts are not much work , missing or wrong working elements are a shame. Its not a bug every player starts with a free technology, the question here is will we remove all freetechs from th ai, or will we go back to the vanilla system. For the ruins, you only should get a choice of a free technology, and this should be related to the era, if not this is a damn bug and we need to rework it. Ahmm iam not sure, a log would help me a lot for the ruins. Normally you should be able to select what technology you will get. Arrrrgggg some settings are still in de_De and not en_Us, this is the reason for the bugs. Its one of the technologies from the scenarios, i thought it would fit fine with CCTP. When you encounter this techs as discovered, can you tell me if the spoken text fit the technology, thx. I have one question: Why wolfes to kindle my cities? I didn't realize it had been changed, I'm re-uploading the mod w/ change right now. Should be done about 5 minutes from this post. A bit out of topic but someone tried to hack my account on steam, lol, i saved the ip and rofl. What a day, i hope there arent any mayor problems at all in CCTP. Just my two cents. You should really take some time to build a page showing what this mod has to offer, what techs, buildings etc. Most people stay clear from it because of the lack of clarity. Thanks for the input, it's always welcome. Gilga has started a thread for this purpose, but so much time has been spent on the new version of the mod, I don't think there's been enough to complete it. Yeah a full feature list would be nice. But i dont know where would i start. Due the massiv number of changes, we could write some pbf file. Playing huge, Decimatus normal pace. No crashes or game stopping problems yet . I got my first policy (Tradition) on turn 57 to get my first Faith point. By then there are no more Panthions or religions to get so religion is not worth much. If you don't get lucky and find an ancient ruins to help out with early faith or culture, you can forget most religions. This is a little worse then in the prior version where I have seen the same thing before. This may just be the penalty of playing Decimatus. "Social Structure" is needed for settlers. I notices that you changes "Social Structure" to so that it needs Scouting. That requires 6 (Tier 6) prior techs plus a few side line techs. It use to be Tier 2. At turn 110 I just got Hunter (tier 5). So I wont be able to build settlers and get a 2nd city until about turn 175. (Unless you get lucky with an ancient ruins giving you a settler.) It also makes the "Liberty" policy tree less valuable since you need Social Structure first to get the free settler it gives. It use to be that even at Decimatus I was getting a 4th city about turn 60 in the prior version. Just advising you of the effect of that prerequisite change in Social Structure.